1. 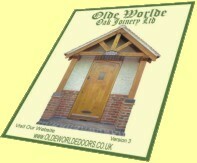 Using the brochure, decide upon your door design, you can always call if you need any help or advice. 2. Complete the order form - you can then post, phone, fax or e-mail your order form to us. 3. On receiving your completed order form, a quotation will be produced. We will send you two copies of each and ask you to check that the details are correct and to sign one copy and return it to us with the required 30% deposit. 4. Upon receipt we will send confirmation of your order, we will also produce CAD drawings for your approval. 5. Return a copy of the signed CAD to us. 6. Your door will now be made from the drawings. On completion we will contact you to arrange delivery. Your door is made to order and lead-time can vary depending on our current commitments.